It’s elevenses and time for that mid-morning cuppa so why not also treat yourself to a cheerful tea cosy to keep your teapot warm? 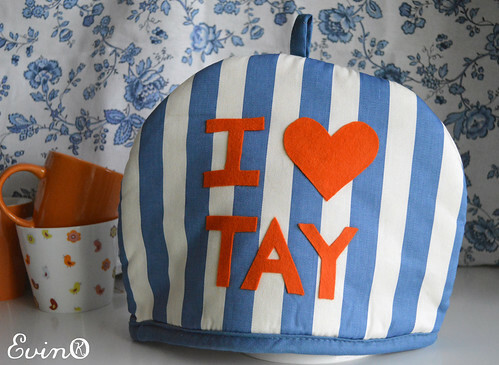 Here’s an easy no-sew way to customize any cloth tea cosy, like the kinds readily available at the corner store. 1. Determine the letter or design layout on the tea cosy. Make sure there is enough space for what you want to put there. 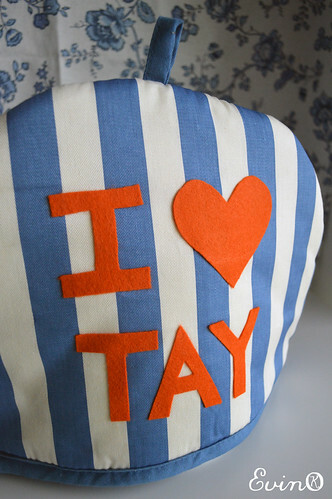 When you’ve decided, trace or draw your design or letters on the contrasting felt. 2. Cut out the letters or design from the felt and also from the fusible webbing. Place them with the fumble webbing between the felt and the tea cosy, making sure any marks you made on the felt face down. 3. Heat the iron and carefully place the cotton kitchen towel over the felt. Iron over the tea cosy repeatedly until the fusible webbing hs melted the felt and tea cosy together. Let cool and gently peel back the towel. Done! This entry was posted in Home | Style, Sewing | Embroidery, Tutorials | Patterns and tagged how to.